The singer’s new husband Sam Cooper announced the happy news to the couple’s friends and family during his speech at their wedding reception. Lily is believed to be 16 weeks pregnant and Sam decided to include the announcement in his speech after they went for the 12-week scan and were told the baby is developing healthily. The happy news comes seven months after the 26-year-old singer tragically lost her and Sam’s baby six months into the pregnancy last November. Earlier in the day, Lily and Sam tied the knot at the St James the Great church in Cranham, near Stroud, Gloucestershire, South West England, before the newlyweds and their guests headed to the couple’s £3 million mansion for the reception which is being held in a marquee in their garden. 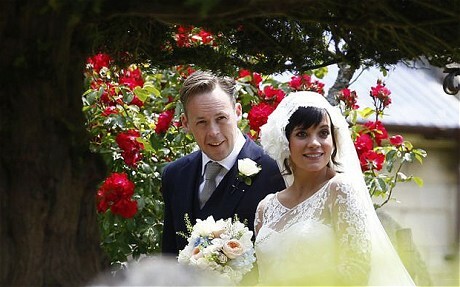 Lily wore a lace wedding dress designed by Delphine Manivet and guests included her actor-and-comedian father Keith Allen, comic Harry Enfield and her brother Alfie. The ‘Smile’ singer’s half-sister Sarah Owen – who also attended the nuptials – previously revealed her sibling and Sam planned to try for a baby in 2011 following last year’s tragedy. Sarah - who runs vintage London clothes shop Lucy in Disguise - said: "They're going to start trying (for a baby) in the New Year. In January 2008, Lily suffered a miscarriage when she was dating Chemical Brothers star Ed Simons.